A clean and welcoming environment is essential for the success of any business, so with around 80% of dirt entering your building on the soles of peoples shoes, effective, efficient and attractive entrance matting is more than just a good first step - it’s a necessity. The nature and construction of Jaymart’s aluminium entrance mats is such that they are stronger and more durable than wired or rollable matting, yet flexible enough to be shaped on site to ensure a perfect fit every time. They also allow each section to align precisely, so there are no unsightly T-bars required. We can also supply replacement strips at any time regardless of a mat’s shape, to allow for changes in décor. In short, the finished mats look better, last longer and work better, and that's got to be a step in the right direction. The Street range of Jaymart Prestigious Aluminium Entrance Matting Systems has long been established as a proven bestseller. Specifically engineered to withstand extra heavy footfall, the Street range continues to be used in airports, shopping centres, supermarkets, department stores, cinemas, universities, race courses and hospitals, and is ideal for applications where performance under the severest of traffic conditions is required. 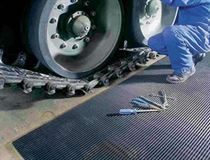 The Buffer-Zone aluminium entrance matting section is the result of 30 years’ experience in the field of preventative maintenance, combining the alternating elegance and strength of ribbed silver aluminium scraper sections and its alternative channeled replaceable strips. Buffer-Zone has been developed in response to the demand for an economically priced yet highest quality competitive alternative to the long-established market leader. Buffer-Zone is suitable for high traffic areas, among them very busy high street shops, leisure centres, banks, libraries, museums and football stadiums.